They could be here, to map the street level view of Adelaide.. should be nice with the trams and vic square all looking pretty Massive publicity for the city if this is true. I'd still prefer if WLM made some Birds Eye Views of Adelaide and surroundings. Did you actually see this car? Otherwise how do you know it's in Adelaide? reported on overclockers australia, and it's doing the rounds in brisbane at the moment. apparently it's suppose to be low key, now announcements.. something about the controversy it made when it hit cnn in america. they don't want a repeat. How exactly does this street view feature work? Never seen/used it.. It's awesome.. check out Chicago.. it's like being there. Btw, spotted in perth yesterday. Pretty cool, I would expect them to run down King William St only? They'll do the entire CBD at least, that's what they've done in most cities around the world so far. In the face of ethical concerns, Google is considering changes to its Street View Google Maps feature that would protect the privacy of those it photographs. When Street View is rolled out in Europe, Google will alter Street View photos to make sure that faces and license plate numbers are no longer visible, and the company is also thinking about doing the same with the U.S. version of the product, said Jane Horvath, senior privacy counsel with Google. Developed by Immersive Media, Street View lets users click on a city street and then see a panoramic photograph of the area. The pictures are taken by special 360-degree cameras roof-mounted on Volkswagen Beetles that cruise around town, constantly snapping photographs. The photos are often so clear that people on the street can be identified. Soon after its May launch, photographs of scantily clad women and men apparently entering adult book stores or strip clubs appeared, and privacy advocates complained that the Street View was invasive. Electronic Frontier Foundation attorney Kevin Bankston was photographed by the service and was among those who complained. 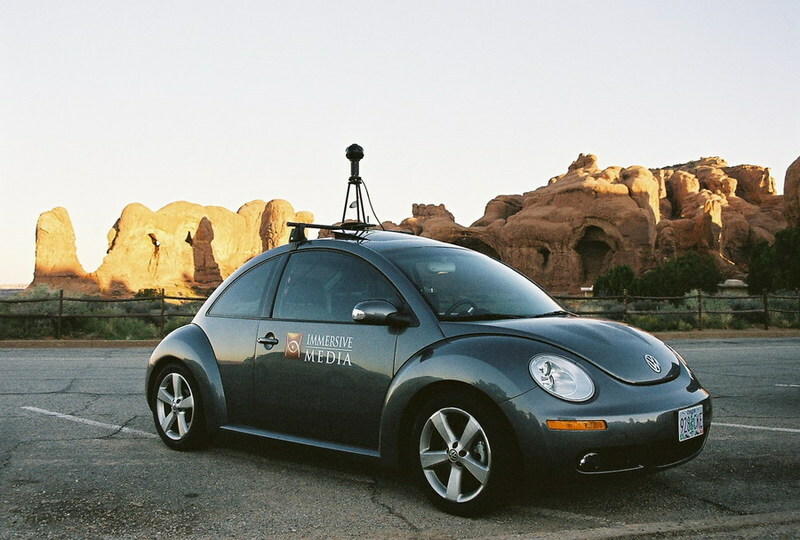 Street View maps are available for 15 U.S. cities, including San Francisco, Los Angeles, New York and Miami. In the U.S., Google can legally publish photographs taken in public places without securing permission from people who happen to pop up in the shots, but this practice violates privacy laws in many other countries. And even if itâ€™s legal, some may still be uncomfortable with the photographs, Horvath admitted. Posted on OCAU... "Spotted black hatch with google on it and the pole on the roof driving around ovingham/brompton this afternoon. I wonder if it got me driving in my blue prius..."
I spotted the car in Woden (Canberra's south) last week. Is it blurred? I'm looking at it in Google Earth right now, looks okay here i think. It's blurred in both Google Maps and Earth for me. If I remember correctly, there's a roof-top courtyard, but it appears totally blank. There's no air con units or anything. Is there? I've never been to the top, didn't realise there was anything up there. Wouldn't make sense to blank it out though.